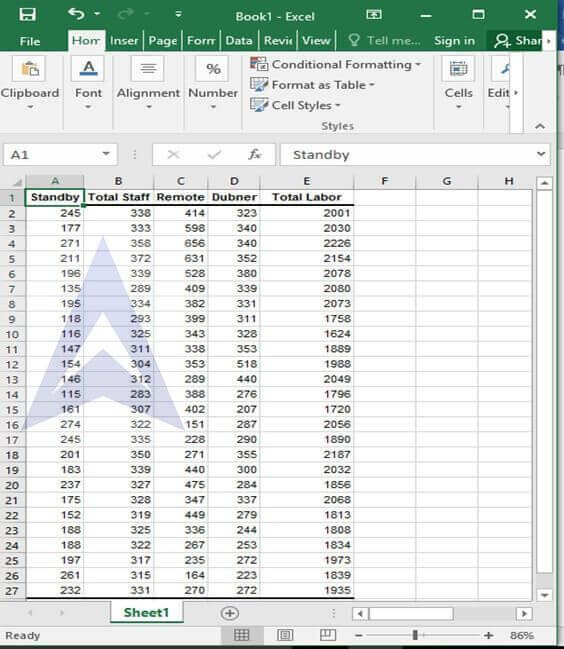 Copy data on to an excel sheet. 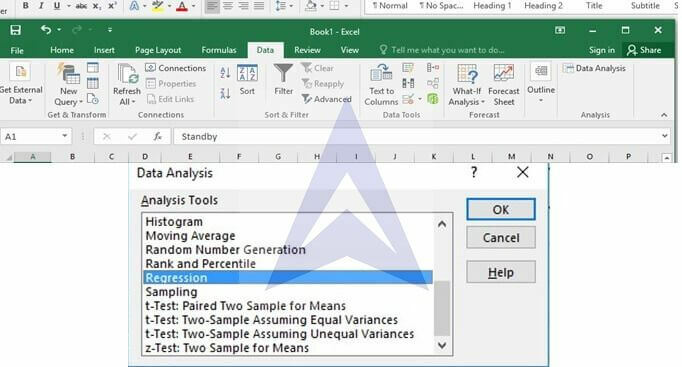 Go to data and select the data analysis add in. Click on it and select regression. Select A1 to A27 as y range and B1 to E27 as x range. Click on label so that it can automatically take the first cell of every column as a label and doesn’t produce error results. The slope b1 means that with a 1 unit increase in total staff present the standby hours increase by 1.76 units. The slope b2 means that if 1 unit of change is seen in remote hours then the standby hours would decrease by 0.13 units. Thus we can conclude that standby hours are directly proportional to total staff present while remote hours and standby hours are inversely related. The slope b0 has no practical meaning as time is never negative. And to have an intercept for time is absurd. E. Construct a 95% confidence interval estimate for the mean standby hours for weeks in which the total staff present have 310 people-days and the remote hours are 400. To calculate t α/2 select the function TINV in excel and put α =0.05 while degree of freedom as 23 (=n-2-1).